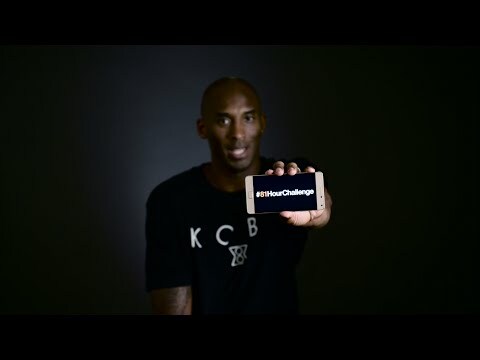 LA Laker's superstar Kobe Bryant and Lenovo are challenging all basketball lovers to take their best shot and be part of Kobe Bryant's #81HourChallenge, an 81-hour non-stop basketball shooting challenge. In January 22, 2006, Kobe Bryant had one of the best performances in NBA history. In a game against Toronto Raptors, Kobe scored 81 points, the second highest NBA score next to a 100-point performance back in 1962. This year is the basketball legend’s 20th anniversary in NBA, and Lenovo celebrates his historic 81-point game by launching the #81HourChallenge campaign as well as the Lenovo VIBE P1 smartphone. "Kobe Bryant has always believed in his dreams. He was determined to achieve his goals and with the right attitude and perseverance, Kobe Bryant made it this far. In the same manner, Lenovo never stops chasing perfection. We work hard to offer only the best to our valued customers. Today, we celebrate the stories behind Kobe and Lenovo's success," said Dino Romano, Country Manager, Lenovo Smartphones, Philippines. Boasting one of the highest-capacity batteries in its class, the Lenovo Vibe P1 is powered by a 5000mAh battery which makes it last up to 81 hours.Additionally, it has a rocket charger that boosts up power in no time and a power-saving switch that keeps energy at minimum when not in use. This powerful smartphone sports a 1.5GHz octa-core Qualcomm Snapdragon 615, with 2 GB of RAM and operates on the latest Android 5.1 Lollipop. Its 5.5-inch IPS capacitive touchscreen with 1080 x 1920 pixel resolution renders vibrant and crisp images for an awesome multimedia experience. The object of the challenge is to see how many points the world can make in 81 hours, while showcasing some of the best shots from around the globe. The challenge will run from 9:00 AM on October 26, 2015 to 6:00 PM on October 29, 2015. Anyone can play the game and participate in the #81HourChallenge. To join, participants simply need to take a video of themselves shooting a ball, then upload their best shot on Twitter using the hashtag #81HourChallenge. For the complete mechanics, visit www.81hourchallenge.com or follow Lenovo Mobile on Twitter (@LenovoMobilePH).